You know that we try to keep you abreast of all of the latest stories in the world of online poker, and worryingly, we have heard a few negative stories regarding Full Flush Poker. A number of players have issued complaints about payment issues and there have also been stories about the Full Flush Poker support department being unresponsive to requests and tickets. This is a worrying development and we would advise you to approach this site with caution if you are thinking about playing on it. Full Flush Poker is a relative latecomer to the online poker scene but given the recent changes that have been implemented in US poker, and its impact around the world, this is not a reason to discount a site. As long as a new poker site can prove itself to be trustworthy and reliable, it may actually represent a better option than many of the existing poker sites. There is always space for a new competitor that provides a high standard of poker gaming and Full Flush Poker may be just the option for many poker players. The site comes under the Equity Poker Network, or EPN, and it is managed and owned by Equity Marketing. The site runs on software that is provided by Playsafe Holdings AS, who are poker software providers hailing from Norway and the site is licenced in Curacao, which should provide confidence to players. If you are trying to recall if you have come across the Full Flush Poker site before, don’t strain yourself for too long. The site received a soft launch in September of 2013, ensuring it was properly up and running for the real money launch it received in November of the same year. This was a hugely exciting time for poker sites that were available for US poker players and the site timed their debut to perfection. They may lack some of the experience and expertise that other poker sites will boast of but Full Flush Poker has a vibrancy and excitable nature that will be of benefit to many poker players. These requirements will not phase the vast majority of Mac users so there is no real reason why you can’t get involved with what the site has to offer. This is a site that can truly claim to be Mac friendly and you will receive all of the benefits and incentives to play on this site as any other player would. This means you will get access to all of the games, all of the tournaments and all of the bonuses that PC players would receive. If you are keen to find an online poker site that treats Mac users as equals as opposed to being add-on players, this is the site that is right for you. When it comes to deciding if a poker site is right for you, it is fair enough to say that the bonuses on offer will play a strong role in the final decision a poker player makes. As a new poker site that is looking to make an impact, Full Flush Poker knows that they have to make their presence felt and this is something that can be seen in what the site has to offer. 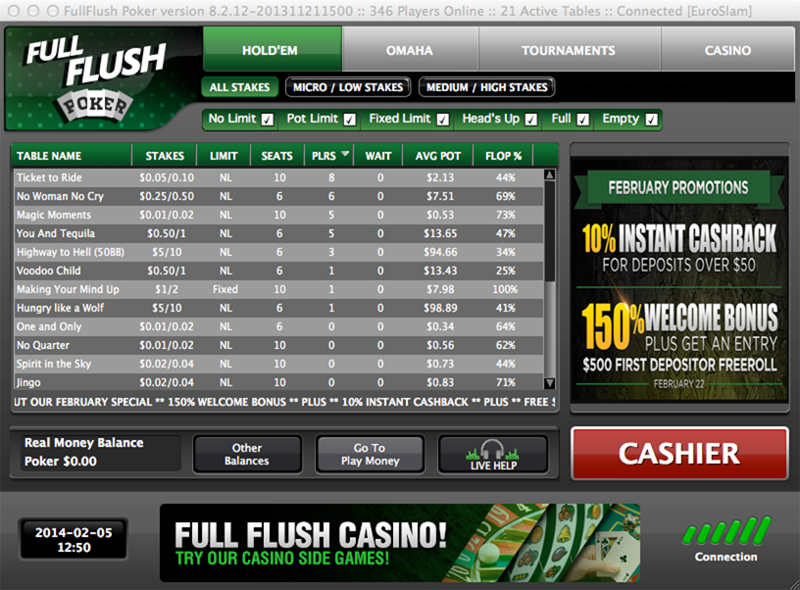 New players on the Full Flush Poker site will find that they have the chance to earn a first deposit bonus of 150%. This bonus is available up to $600 and the minimum deposit eligible for this bonus is $25. Players will need to earn 20 Player Option Points (POP) for every $1 that they deposit and there is a time limit of 45 days for a player to claim their bonus in full. New players on the Full Flush Poker site will also be provided with 10 copper coins. These coins are your entry to the First Depositors $500 Freeroll which takes place on the final Saturday of every single month on site. Players have a total of 90 days to use their copper coins in the freeroll event. The site has quickly developed a reputation for offering a monthly special so no matter when you log in to the site, there will be something of interest. In February 2014, the special revolved around players depositing more than $50 qualifying for 10% cash back there and then. Anyone that is keen to boost their bankroll in a real and meaningful way will be delighted with this sort of bonus. Full Flush Poker is looking to encourage as many new players on to the site that they can and this is why they have a Refer A Friend bonus on offer. It’s a simple offer and if you refer a friend and they then earn 500 POP within their first 30 days on site, you and your friend will both receive $25. If you are looking to increase your social element on site, inviting a friend along is a good way to do so while also boosting your bankroll. There are a number of tournaments on offer on Full Flush Poker with a number of promotions and added incentives to play peppered throughout the standard week. As a US friendly poker site, you wouldn’t expect Full Flush Poker to have the widest range of promotions on offer. This isn’t a problem for most players and the most important thing for the site is to make sure that every deposit method they offer is of a high standard and easy for poker players to use and utilise. Full Flush Poker provides a person to person transfer option and this is the fastest and simplest way for people and businesses to transfer cash. It is also a very safe way to deposit funds into an account and the fact that players can deposit cash at a local office makes it a very good choice. The full range of person to person transfers for Full Flush Poker include cash, credit card and over the phone transactions. Full Flush Poker also allows players to deposit funds with a credit card, debit card or even a prepaid card, although prepaid cards that are recognised as being US only will be declined. The site accepts MasterCard and Visa reloadable cards and prepaid cards, so there are plenty of options to choose from. The site can accept deposits and transactions in a variety of currencies but all deposits will be exchanged into US Dollars before being accepted into an account. Players making a deposit via a credit card will find that their transaction will be concluded within a matter of minutes, which is the same as an e-wallet payment. Players depositing funds via a person to person transaction will find that the transaction may take up to 15 minutes to clear. 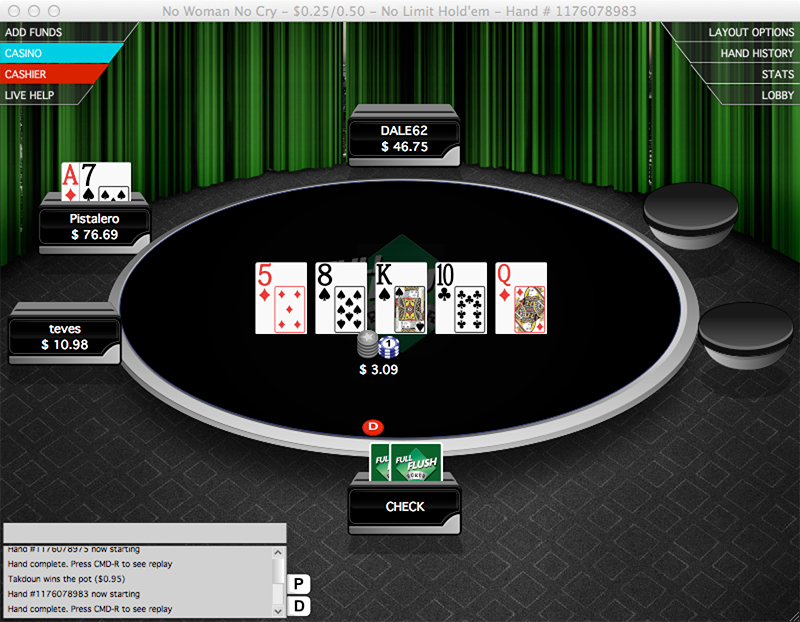 This is due to the fact that Full Flush Poker needs to check the confirmation number for the transaction. With respect to withdrawing money from Full Flush Poker, there are a number of options at your disposal. A Person to Person withdrawal can be undertaken for sums of money between $100 and $1,000 and the processing time can take up to 24 hours. Depending on the amount of money that is withdrawn, there may be a fee applied to this transaction. For money orders, the minimum withdrawal amount is $300 and the processing time can take between 7 and 10 working days. All money orders sent out to poker players will be transported by courier service and all requests for payment in this manner will be subjected to a money order cutting fee of $100. This means it may be best for players to only use this method if they are making a big claim. It is possible to withdraw funds via bank wire or checks, with these processes taking between two to seven days for bank wires and one to five days for checks. For the transaction to occur on the same day, players are requested to make their withdrawal request before 10.30am EST Monday through to Friday. There is a full tournament schedule listed on the Full Flush Poker site and there is a total of 21 different tournaments taking place every single day on the site, with a strong spread between morning and evening time. This should ensure that there is an option for every player, regardless of their location or leisure time. The site offers a number of Bounty games, called The Outlaw, where there is a $100 bonus on offer to the player that knocks out the Outlaw. These games are available in the .50/$1 and the $1/$2 ring games that take place every day between 5 and 7pm EST. The Outlaw will also be found in the big weekend games, adding extra spice and incentive for those events. The weekend on Full Flush Poker gets underway with the Big Deepstack event, which is a $2,000 guaranteed tournament. The buy in is $10+$1 or players can use 1,100 Promo Bucks to gain entry. There is also an option to gain entry via satellites which take place every day on the site. The buy-in for the satellites stand at $0.50+0.05 where players can pick up 110 Rubies, which will provide entry to the Big Deepstack event. The big game on Full Flush Poker takes place at 3pm EST on Sundays, with the $5,000 Sunday Blowout Guaranteed tournament. There are three ways to get involved with this big event. The standard buy in is $20+$2 or players can utilise 2,200 Promo Bucks to gain entry to the big event. There are also a number of satellites running throughout the week where you can play your way to the big event for just $1+0.10. Satellite players have the chance to play for 220 Rubies, which can provide direct access to the main event on Full Flush Poker.